With echinacea, we use as medicine the roots, leaves and flowers. With Echinacea purpurea, the most potent medicine is contained in the flowers. We like to harvest all the parts of echinacea in their prime and make a tincture with each. Then, we combine the tinctures for the most effective medicine. Echinacea is an immunostimulant and supports lymphatic circulation. It is particularly effective for the onset of colds or flu especially as a result of depletion from long term stress or overwork. 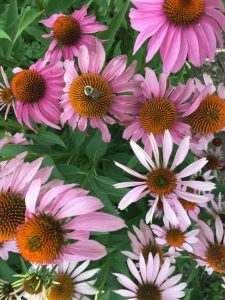 Antiseptic and moderating to histamine response, echinacea is useful both internally as a tincture and externally as a salve for snake & insect bites. In addition to making a tincture, oil and salve, you can infuse the flowers in honey. Chop them up and steep in honey for at least one week. Enjoy any parts of the plant either fresh or dry as a tea. The oil and salve can be used for snake and insect bites, cuts and wounds where immune stimulation is beneficial in healing. Here’s a recipe from Jade Alicandro of Milk and Honey Herbs for a Winter Immune Honey. Cautions/Contraindications: From Matthew Wood: Overuse can lead to an exaggerated white blood cell count. Not to be taken during leukemia.